Today marks six years since the closing of the London 2012 Paralympic Games and the end of a remarkable summer of sport. 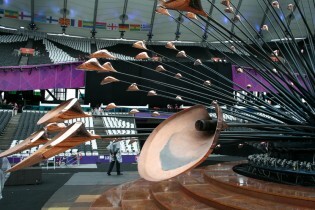 It was a very busy time for us, our teams providing extensive engineering and scenery for the Olympic and Paralympic ceremonies and also creating Thomas Heatherwick’s iconic cauldron: a stunning design and an incredible feat of Stage One engineering. 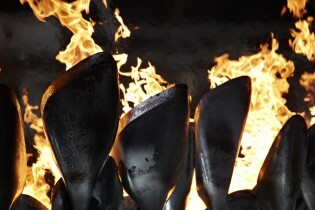 Briefed to design a cauldron with ‘no moving parts’, Thomas Heatherwick instead created one with thousands. From first receiving the 3D design drawings, it took our Technical and Automation team nine months to develop the cauldron into a fully functioning reality, able to deliver the pivotal moment for each of the four ceremonies. Code-named ‘Betty’, it was quite possibly the most secretive project we’ve ever worked on as well as being the most complex device we’d ever built. 204 tapered steel stems, each topped with an individually designed copper ‘petal’, all arranged in ten concentric rings and attached to a five-tier ziggurat base. It was lit whilst in an open position, the stems rising gracefully to create a bowl of flame. From an engineering and performance perspective, there was no room for error. Read more about the technical challenges and ingenious solutions in our full-length case study, here. On 9th September 2012, ‘Betty’ was extinguished by Paralympic athletes Ellie Simmonds and Jonnie Peacock, who lit torches from the final petal, sharing the flame with performers across the field of play.